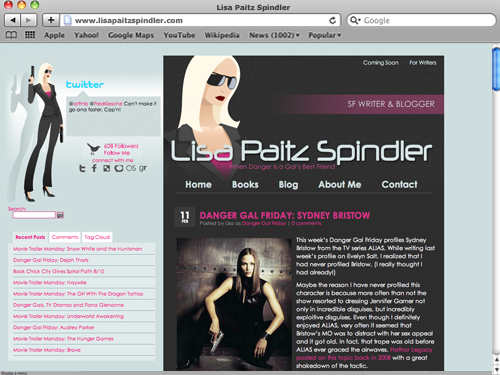 Yep, this is my “Danger Girl” blog design where I wax on about my favorite hobby, writing science fiction. A special feature are the weekly “Danger Gal Friday” posts where I profile exceptional female characters from science fiction books, movies and TV. This is a WordPress blog theme that uses StatPress and several security plugins I include with every theme: Bad Behavior and WP-Spamfree. Other important plugins include WP Super Cache, WordPress Editorial Calendar, WordPress Mobil Edition. Google XML Sitemaps and Google Analytics among others. The tabbed menu in the left column tabbed interface was created with jQuery and PHP. The Danger Gal website has been a Screenalicious featured design.